Whitinsville, MA – (September 7, 2017) – Blackstone Heritage Corridor, Inc. (BHC) has selected the images for its 2018 calendar, curated from submissions by local photographers in a photo contest focused on the Blackstone River and the watershed. Wendy A. Henschel of Whitinsville, MA, submitted a stunning image of the Linwood Falls in Northbridge, MA, titled “Change of Seasons” which landed her the coveted cover shot for the 2018 Blackstone River Valley National Heritage Corridor Calendar. The New Year begins with a scene of Lake Nipmuc in Mendon, MA, captured near sunset with a darkened sky and the sun’s fading light glistening off snow-studded trees and reflecting in the water below. This photo was captured by Carole Carnovale, a resident of Mendon. That being said, it was difficult to overlook some of those and as a result, a winter shot of the Linwood Falls was selected for the February calendar image, taken by Wendy A. Henschel who also submitted the colorful Linwood Falls image which secured the cover. It was the stunning contrast of blue paint on the gears of the Mumford River Flood Control that captured the attention of the judges looking at Carol Dandrade’s photo taken at Whitin Machine Works along the Mumford River in Northbridge, MA. An Uxbridge, MA, resident, Dandrade’s photos have appeared in BHC’s calendars the past few years, and this photo was selected to appear in March. Mark J. Paine of Woonsocket, RI, was in the right place at the right time as a swan came in for a landing on the Blackstone River in Cumberland, RI. Paine snapped an incredible image of the swan’s descent upon the water, reflecting a mirror image below its wing-stretched body and casting a magnificent splash around itself. This powerful image was selected for April. Suzanne Buchanan of Harrisville, RI, was riding her bicycle along the Blackstone River Bikeway in Blackstone, MA, and stopped to admire the railroad bridge crossing the Blackstone River and submitted her image titled “Keeping on Track” to the contest. This photo appears in May. The longest day of the year falls in June and the image selected to represent the mid-year was taken at the Manville Dam in Lincoln, RI. A dreamy raspberry-orange sky is reflected off the Blackstone River as the sun sets late in the day with a brilliant cascade of blue water coming off the dam and Subham Sett of Lincoln was there to witness it. Flip the calendar to July and the lights are back on with a unique view of the Blackstone Canal and towpath at Blackstone River & Canal Heritage State Park in Uxbridge, MA. Puffy white clouds are reflected in the canal below as sunlight dances off the rich foliage surrounding the canal and the adjacent field. This captivating photo was captured by James Hunt of North Grafton, MA. The Blackstone Valley Paddle Club, one of BHC’s longest running volunteer activities, was on the Linwood Pond in Northbridge, MA, this past summer and Suzanne Buchanan, BHC’s Volunteer Coordinator, was once again on the scene with her cell phone and submitted a photo from that night’s excursion. The judges selected it to represent the month of August because it showcases not only the beauty of the scene but also celebrates the watershed’s impressive recreational resources. Buchanan captured the shot from the banks of the Mumford River Walk and the paddlers were across the pond, allowing the sun to reflect off the water in the foreground. Carol Dandrade takes us back to Blackstone River & Canal Heritage State Park for the month of September with an almost mystical photo of a trail head leading to the mist-covered river below. An aptly-placed sign on a tree points “To River” with a blast of autumn sun shining on leaves just starting to turn color and falling to the ground below. Turn the page to October and you’re met with fall’s brilliance, captured at the familiar railroad trestle that crosses the Mumford River alongside Route 122 in Uxbridge, MA. Robert Mielke of Uxbridge submitted the photo, capturing October in all of its glory. When November arrives, it’s as though time stops and holds you between the bright colors of fall and the eye-squinting brightness of winter’s fresh fallen snow. James Hunt of Uxbridge, MA, stood upon the rear of the dock that reaches out over the Blackstone Canal at the River Bend Farm Visitor Center in Uxbridge and snapped an image of the landscape which exudes the crispness in the air and the very last remnants of fall’s foliage. A cloud-filled sky reflects on the historic canal below, giving the feeling one could jump off the dock and into the clouds. The “year of the river” ends while still at the River Bend Farm Visitor Center with Wendy A. Henschel’s December photo of the familiar red barn and surrounding property next to the canal covered in snow. 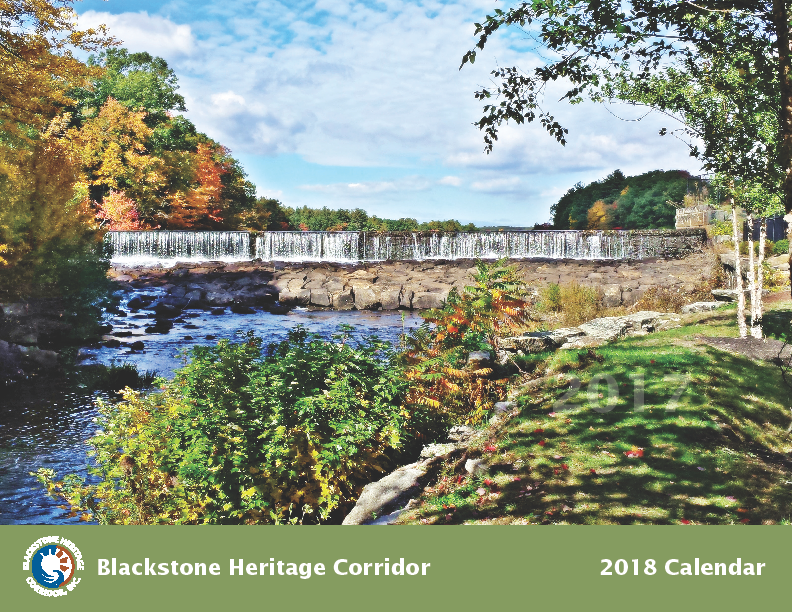 The 2018 Blackstone River Valley National Heritage Corridor Calendar will be available for sale beginning November 1 at the BHC office at 670 Linwood Avenue, Whitinsville, MA and also available on the BHC website (BlackstoneHeritageCorridor.org).